Agate is a moderately hard rock, primarily composed of silica (quartz). Montana agate and sapphire are the two State gemstones of the State of Montana. Montana agate is sometimes also referred to as “moss agate” (agate that has colored inclusions that may resemble moss) or “scenic agate”. The individual crystals of agate are microscopic (cryptocrystalline), which helps to give agate a hardness of approximately 7 on the Mohs hardness scale. The hardness is important for jewelry-making because relatively hard rock can take a good polish and is durable (more about the structure of agate and quartz). The background (matrix) of Montana agate ranges from nearly clear, through milky grey-blue to white. If the agate is composed of very fine layers, a small percentage of Montana agates may show rainbow iridescence (also known as iris agate). 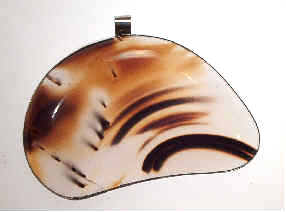 Credit: Dr. Roger Pabian of Nebraska State University maintains an awesome bibliography of agate literature at his website: http://csd.unl.edu/agates/agatepageintro.asp, which was invaluable in researching some information on Montana agate for this page and for related pages. It's probably safe to say that all Montana agate has been transported many miles from its original location. The transport process has tumbled the agates along the streambed, and weak or cracked rocks have either fallen apart or else the cracks have been “healed” by exposure to the silica-rich waters of the Yellowstone River. 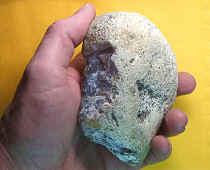 Montana agates are found over a broad area along the Yellowstone River valley and adjacent plateau areas from Emigrant MT to the North Dakota border. 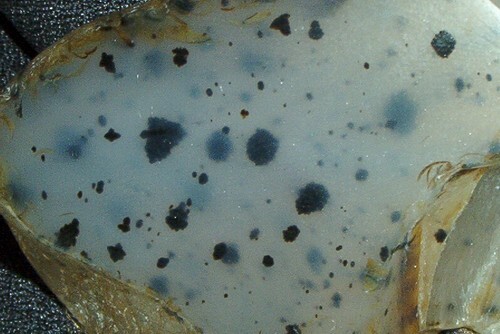 Rough Montana agate often resembles a potato, and is difficult to distinguish from other rocks. In the plateau areas, Montana agates may have developed a distinctive white crust, although the agates that are found away from the Yellowstone River are often more cracked and checked than the rocks that are found along the river. Most people start collecting Montana agate by breaking likely-looking rocks with a hammer in order to learn to identify Montana agate….. experienced collectors try to avoid hammering the rocks in order to avoid ruining a potentially beautiful specimen. Back at home, the best way to evaluate Montana agate is under a strong light. Wetting the specimens may also help to show off the interior. (more about working with Montana agate).